engagement party « I'd rather be in France. 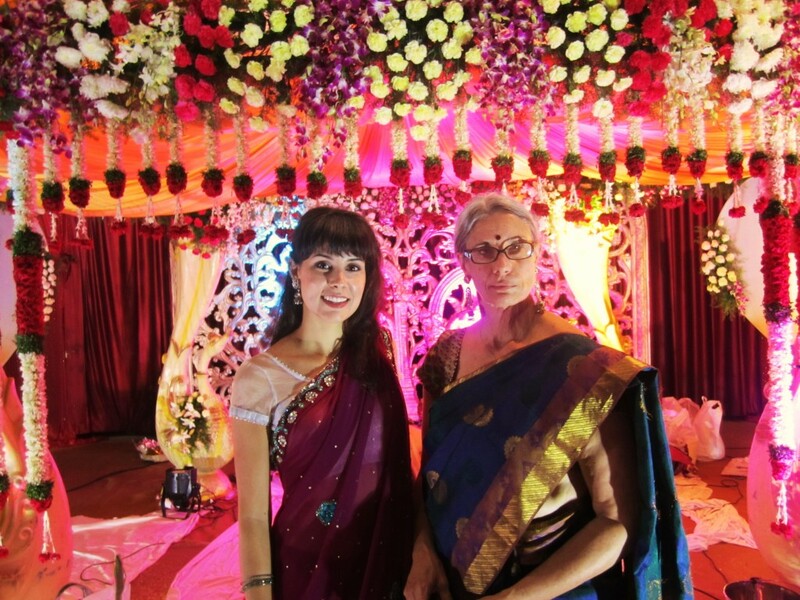 The inspiration behind my recent trip to India with my mom was an invitation to the wedding of my mom’s former teaching assistant at Auburn University, Priyanka. The bride- and groom-to-be actually met while they were in school at Auburn (a “love marriage,” as it was called throughout the wedding weekend). Because I have so many photos to share in this post, I’ll keep my commentary to a minimum. 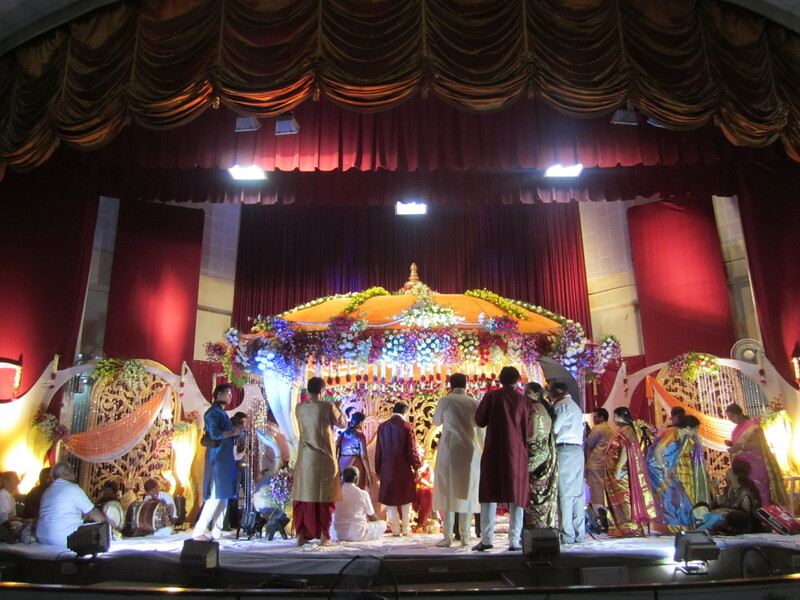 Suffice it to say, it was a fascinating cultural experience, and I wish the newlyweds all the happiness in the world. I’m also extremely grateful to Priyanka, her family, and her family’s friends who took excellent care of use while we were visiting. After flying to Hyderabad where Priyanka grew up and where the wedding would be held, the first stop was a trip to the mall to buy outfits that weren’t quite so American. 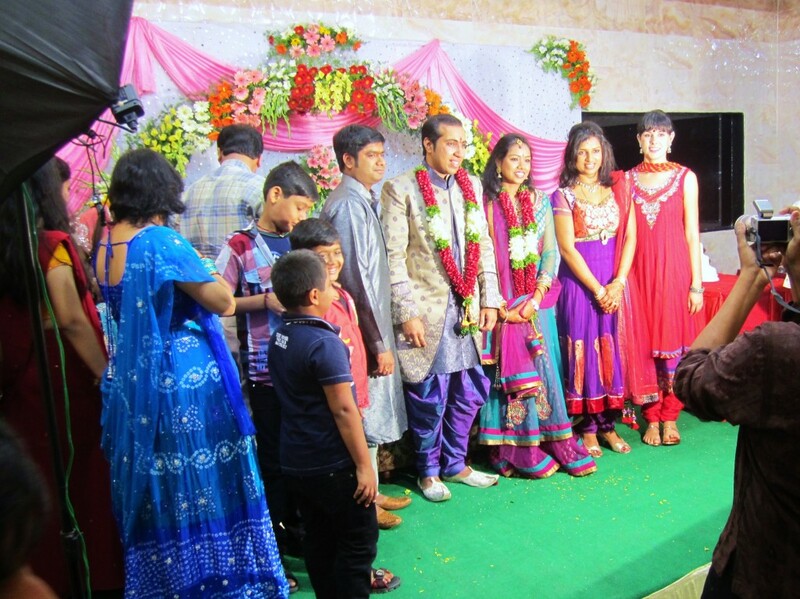 We arrived at Priyanka’s parents’ home Saturday evening in the middle of the mehndi ceremony. 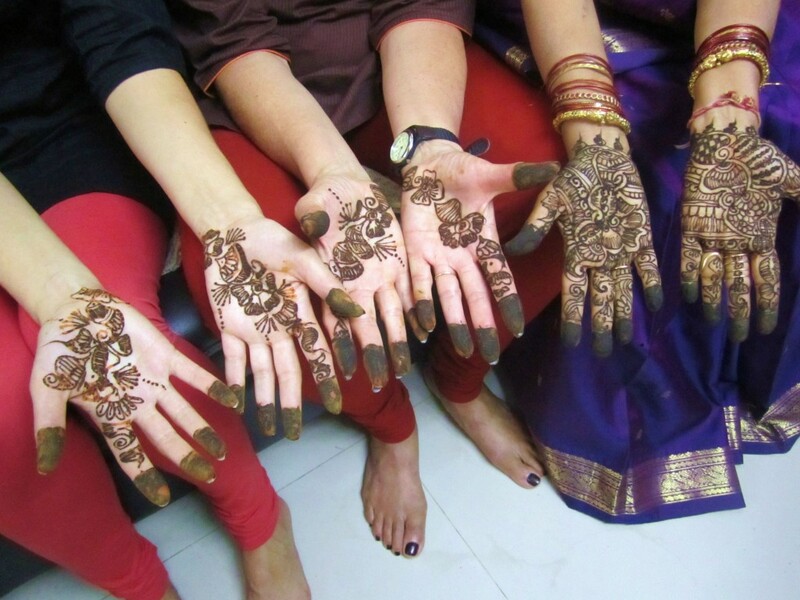 This informal ceremony was held in an empty apartment upstairs, and involved dozens of women and girls sitting on the floor and in chairs chatting as they waited for their turn to have their hands decorated with henna by several women who were hired for the occasion. 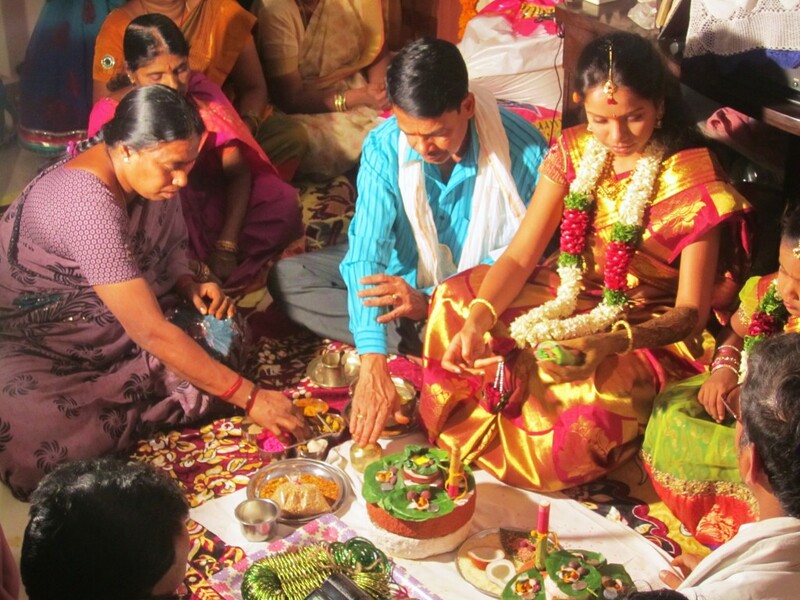 The bride, above, had the most elaborate designs, which covered her lower arms and her feet. Her designs took about four hours to complete. This was the first time we met Priyanka’s family and close friends, and they couldn’t have been more welcoming. 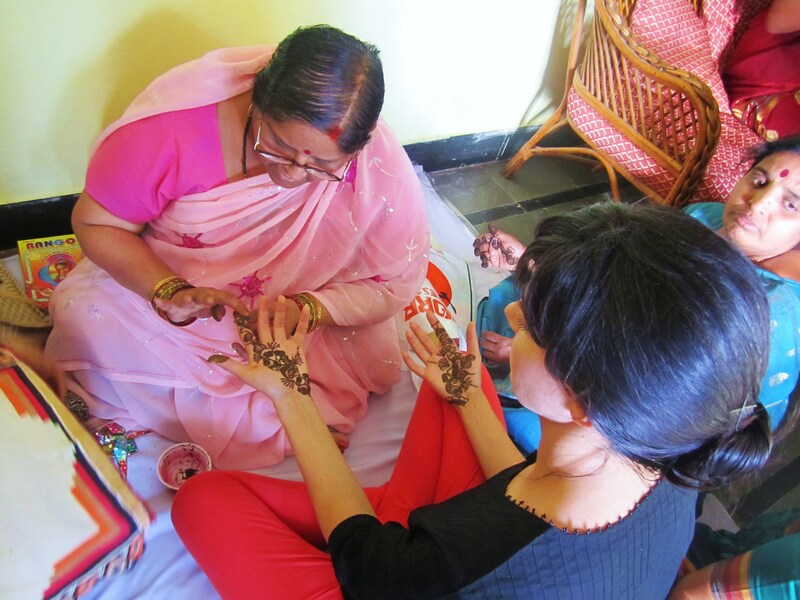 My mom’s and my hands (middle and left) alongside a woman who opted for a more elaborate design. This woman, Anjali, ended up taking us shopping for sarees that same night (more on that later). 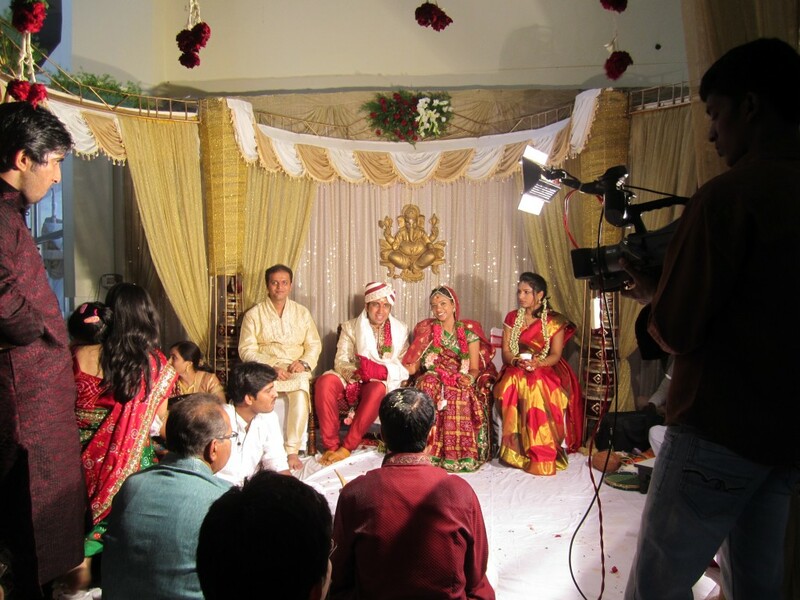 A pre-wedding ceremony was held in her parents’ living room later that evening. At the end, after they ground grain and sifted flour onto Priyanka’s head through a cloth, a group of women held small lanterns and sang a song. 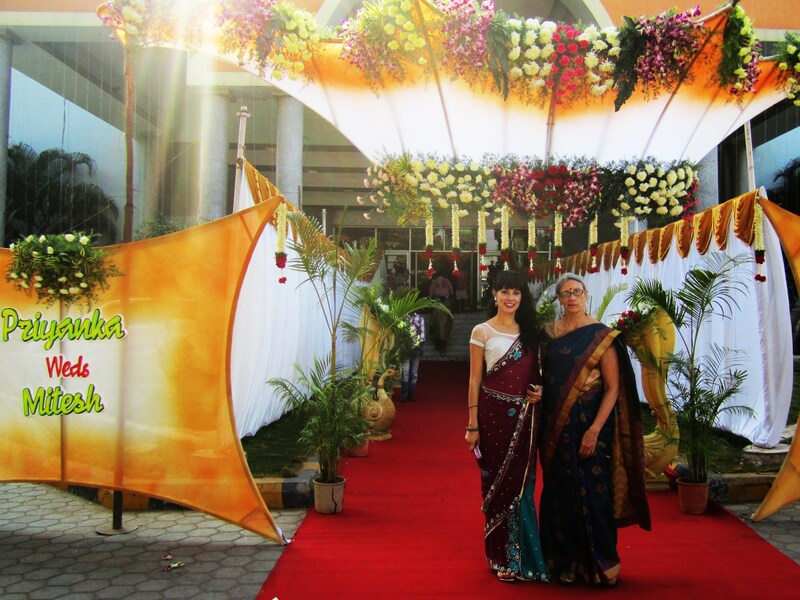 As I mentioned above, we ended up going shopping later than evening for sarees for the wedding. When Anjali learned of our intent to buy traditional outfits to wear to the engagement party the next night and the wedding the day after that, she insisted she take us shopping in her neighborhood. Otherwise, we wouldn’t get all of the proper pieces and we would pay too much, she said. A plan was formed to meet her the next day to shop, but when she realized the shops might be closed because it was Sunday, she arranged for us all to ride to her neighborhood that evening to catch the shops before they closed an hour later. 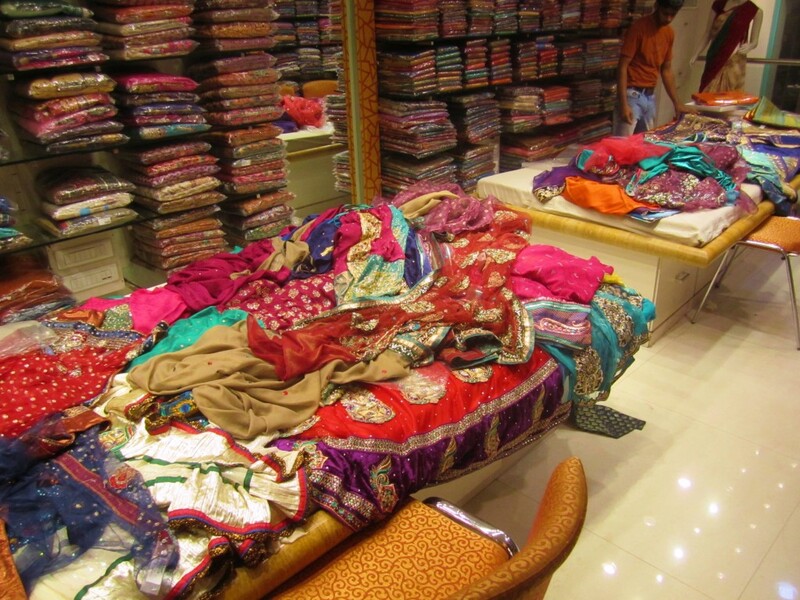 We weren’t sure what was going on because the conversation involved ten different people and was in Hindi, but we did what we were told and found ourselves at a beautiful store with four floors of sarees and other dresses. 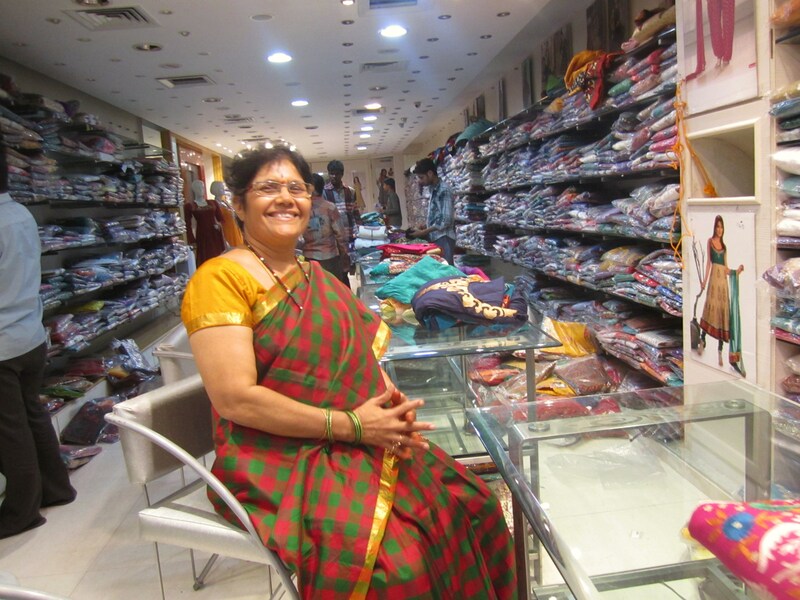 One of the clerks at the store led me to an empty table, and after Anajli told him some basic guidelines based on questions she had asked me, he started pulling sarees from the shelves behind him. Based on my reaction to each saree, he would turn and pull out several more. Soon the table was covered. When I really liked on, he would put it on me. Anajali would exclaim something like, “This is the one!” but I kept going until I found what I was looking for, a magenta saree with blue accents and a moderate level of bedazzling. 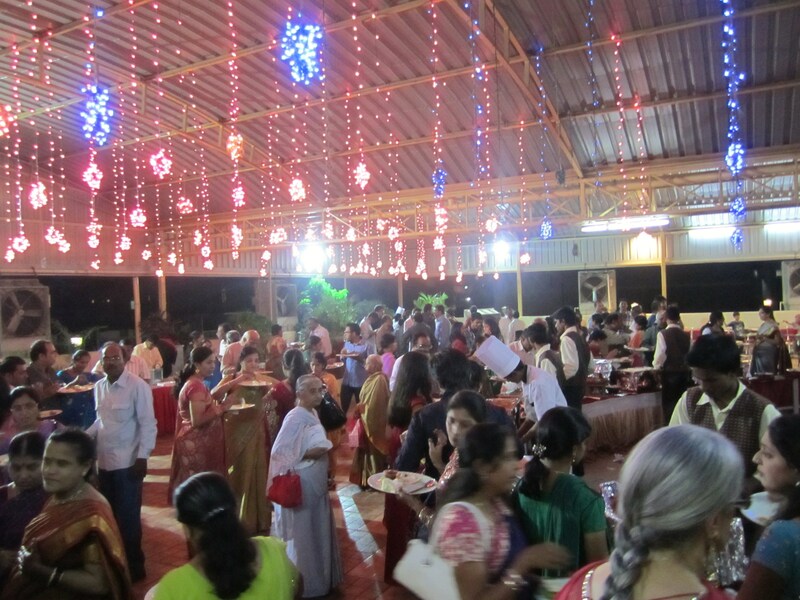 Meanwhile, my mom was taken to another table and shown pure silk sarees in various colors and patterns. 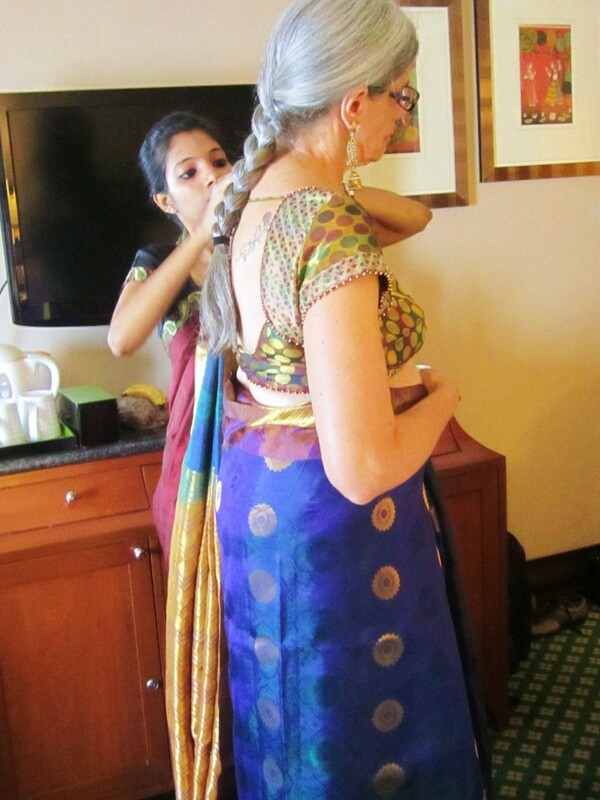 She found one she loved, and after they found tops for both of us to wear since there wasn’t time to sew the custom top that usually comes with the sarees, we went through a similar process to pick out shalwar kameez (a dress-like tunic with match pants) for the engagement party. We finished at 10:30pm and only later learned the store actually closed at 9pm. We also learned Anajili, pictured above, owned the building. Sometimes it really helps to know the right people. All dressed up for the engagement party! The engagement party entailed a number of separate ceremonies with the bride, the groom, and the bride and groom together. At the end of the ceremonies, the groom officially proposed. They also cut a cake and fed it not only to each other but to many of their family members as well (who in turn fed them cake… so much cake!). The bride- and groom-to-be with the bride’s brother, his wife, and me. 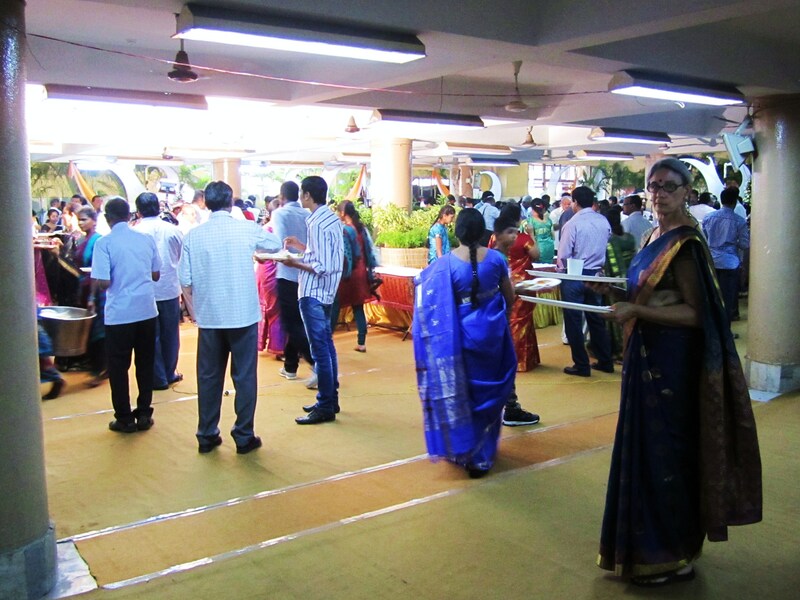 As with all of the events we went to, this one involved an impressive spread of food. Might I remind you that this was still just the engagement party! The big day came, and after trying in vain to dress ourselves in our new sarees, we helplessly called the front desk at our hotel. This young woman came up and very sweetly helped us. 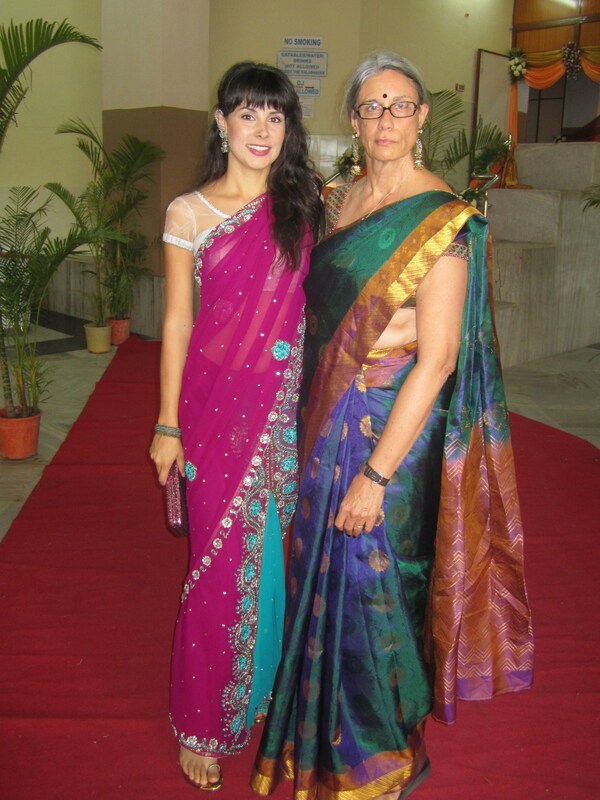 When she was finished, our sarees were impeccably pleated and draped, and we were on our way. 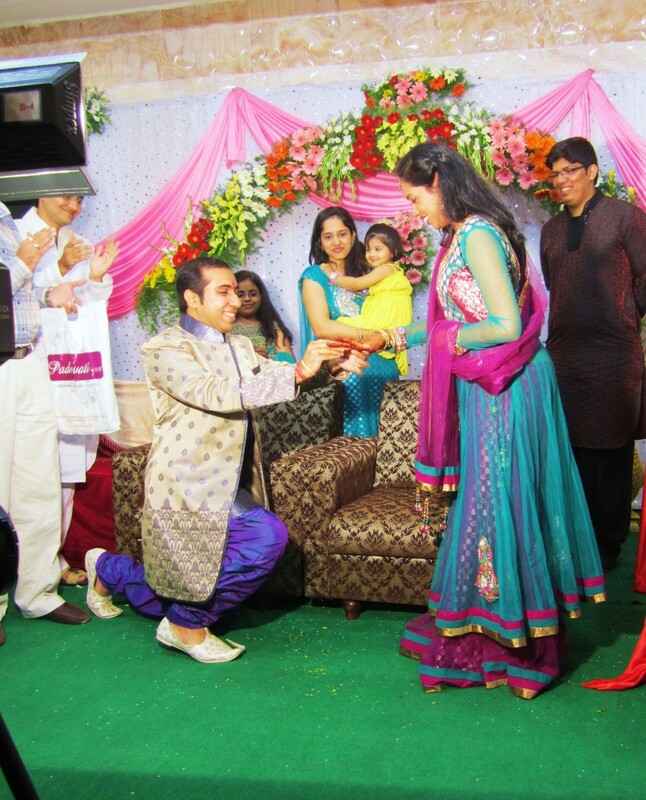 The wedding was an all-day affair and was held at a large venue with two separate stages. 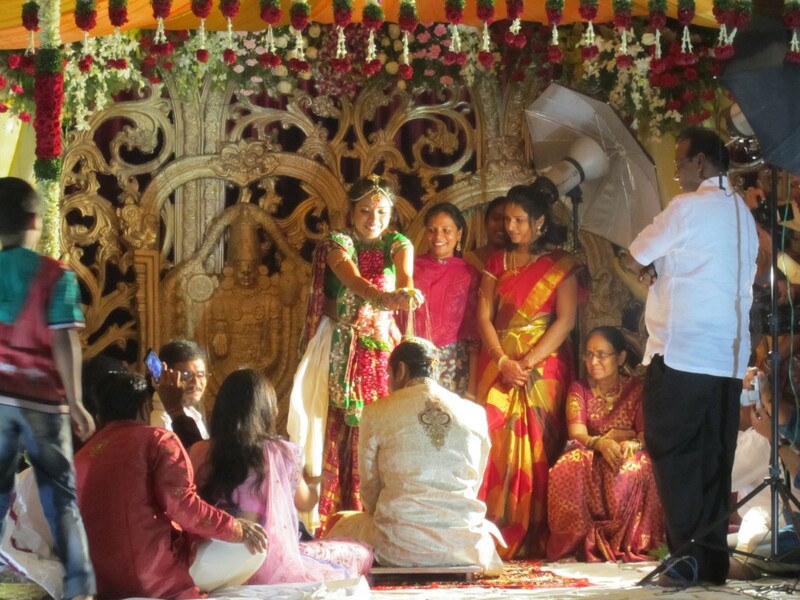 Because the bride was from Hyderabad and the groom was from Mumbai, their respective Hindu traditions required different ceremonies and thus different stages. The whole wedding party moved back and forth between the stages throughout the day. 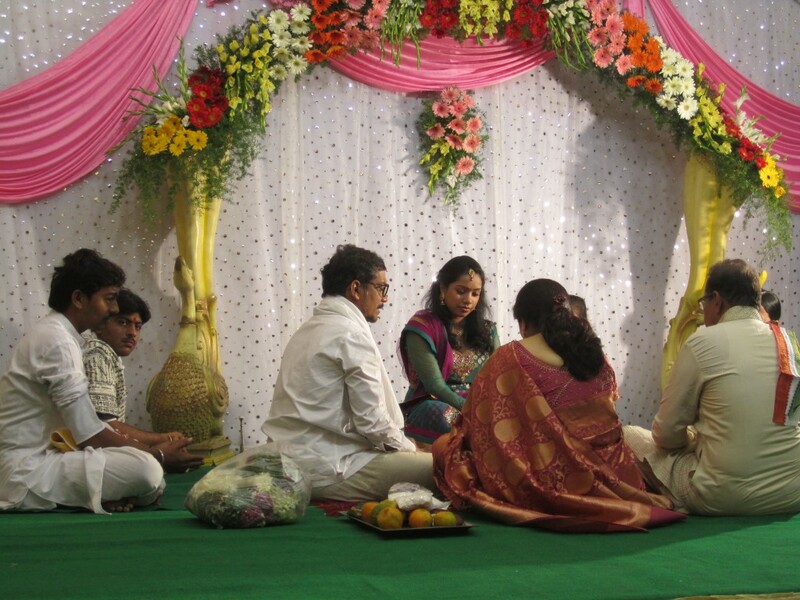 An interesting thing about the wedding was the independence of the ceremony from the audience. Unlike an American wedding where the ceremony is performed to the audience, these ceremonies began and ended without any grand announcement, and people in the audience moved around and chatted with each other throughout the day. Those who wanted to watch the ceremony would walk onto the stage and either sit or stand. At times, it was actually impossible to see the ceremonies from the audience seats because so many people were standing on the stage. 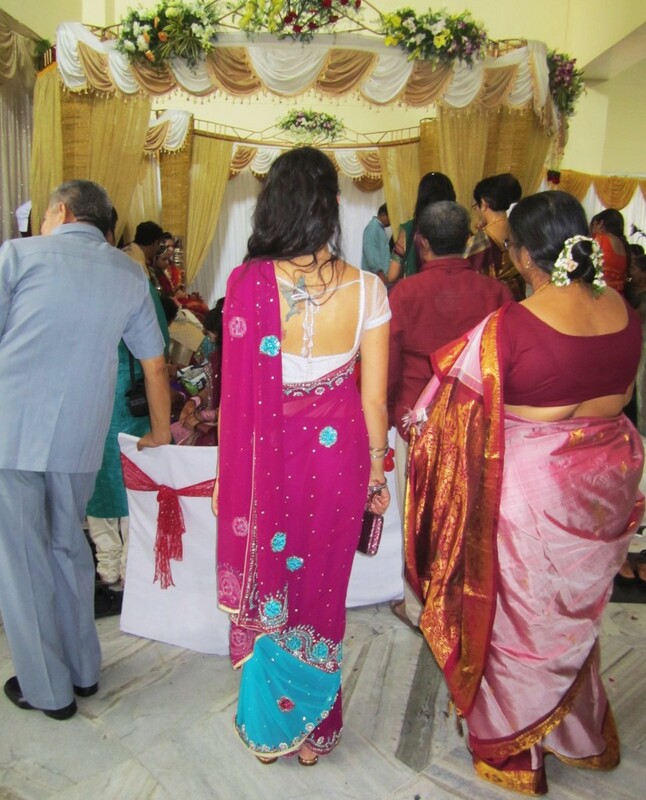 A peak at the back of my saree. Throughout the day, an even bigger spread of food was served to the hundreds and hundreds of guests who came to the wedding. We stayed for about seven hours and left before all of the ceremonies were complete. I don’t see how Priyanka and her family survived the whole process (and still looked stunning!). Four days of ceremonies that concluded with a marathon wedding day attended by 500 or so guests (which is actually less than the typical Indian wedding due to the fact the ceremony was held on a Monday during the day). This experience made me really made me think about the American weddings I’ve attended. 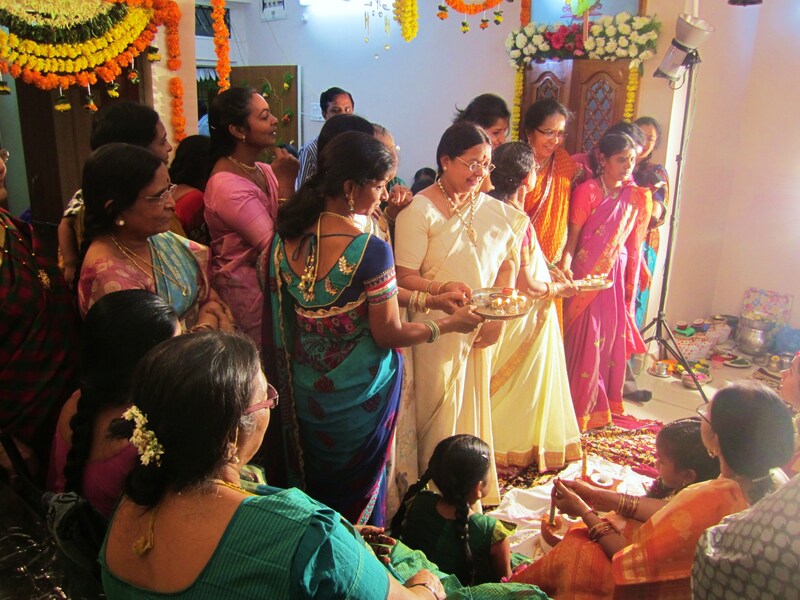 Although I still am not in favor of tradition simply for the sake of tradition, I did admire the thoughtfulness and specificity of the Hindu ceremonies and the high level of symbolism involved. I also loved the amount of participation required from not only the bride’s and groom’s immediate families but their extended family and friends as well. At several points throughout the weekend, people even insisted my mom and I participate. I loved the part of the engagement ceremony where the bride and groom fed each other cake and then exchanged bites of cake with their parents, siblings, in-laws, and grandparents. 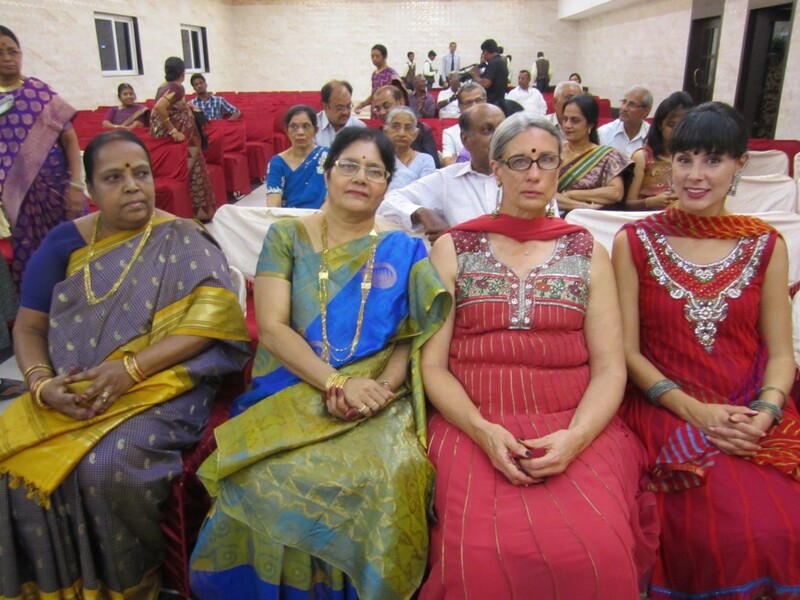 This demonstrates an even broader observation I made during the trip of the general interconnectedness of the Indian community. The reason so many people come to these weddings is that is how many people are active parts of the bride’s and groom’s (and families’) communities. It made me question the relative independence of my own life.